Use Download my app campaigns to promote downloads of your apps to Oath’s 600 million mobile users via Native & Search’s native ads. The steps to create a campaign to drive app installs are straightforward and easy to follow. 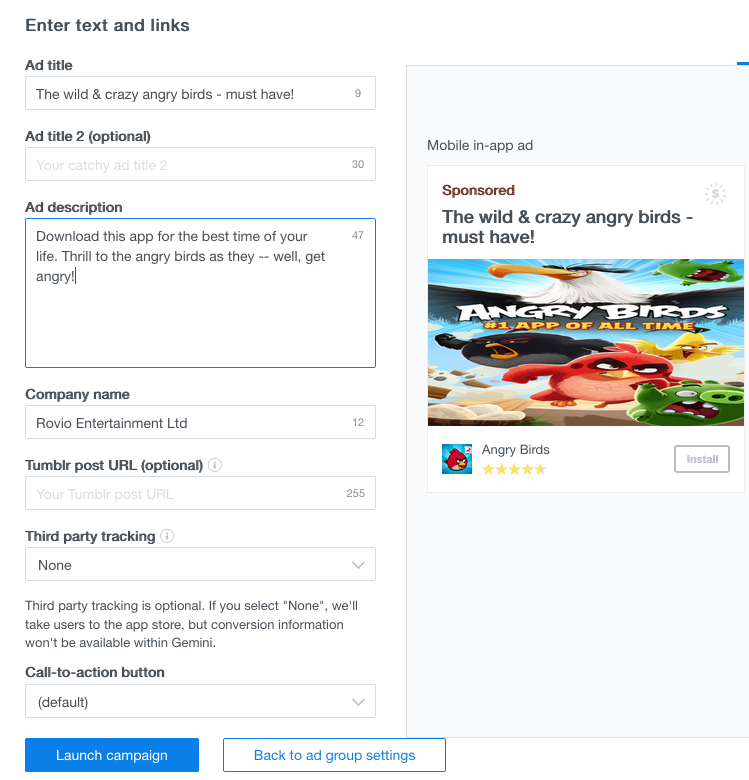 You start by creating a new campaign, followed by uploading your app URL from either the Apple App store or the Google Play store (or both), setting ad group details and launching your campaign. An app install campaign is only served to mobile and tablet devices. A prerequisite for creating app install campaigns is a URL for Google Play or the Apple App store. Use this campaign type if you want users to land on the Google Play or Apple App store when they click your ad to download your app. Download my app campaigns drive performance, greater reach and ROI on mobile and tablet devices. Pricing is oCPC: You pay for clicks, but optimize to a CPI target with image ad campaigns. If you set up an app install campaign for video, you’ll also utilize an oCPC bidding strategy. The cost will be per click, which is more efficient. 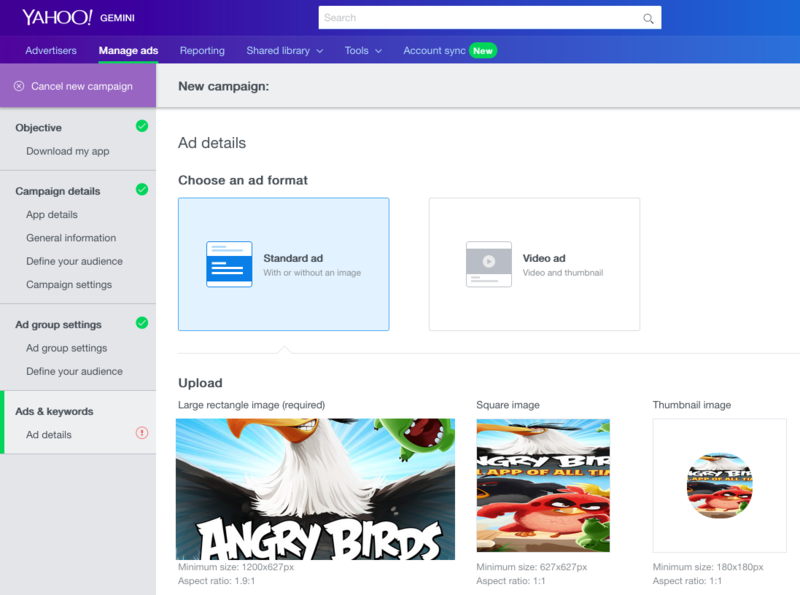 From the Yahoo Native & Search Manage ads tab, click New Campaign. In the Objective panel, click Select for Download my app. In the App details panel, enter your app URL. Simply copy the URL link to your app from the Google Play Store or the iTunes store and paste it in the field. Once you’ve entered your URL in the app store, you’ll receive confirmation that your app has been setup with server-to-server tracking with a third-party partner. In the Country field, make sure the country you select matches the country code in the app URL. Click Get app details to retrieve your app name. You’ll now see additional campaign creation fields displayed. You may receive this error message if the install tracking is not correctly set up with Native & Search. To help you drive app installations, we would like to verify the install tracking prior to campaign creation. Please speak with your app tracking vendor and enable server-to-server install tracking in Native & Search before creating the app install campaign. For more information, check out the section on Tracking at the bottom of this page. 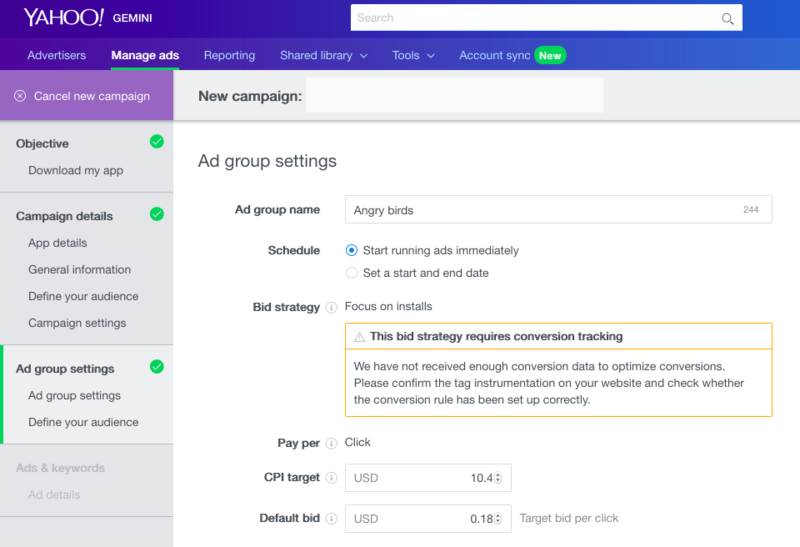 In the Ad group settings panel, enter the name, schedule, bid strategy and other information, including Pay per Click, CPI target and Default bid, for your new campaign. In the Define your audience panel, select the desired targeting for the campaign. Note that Audiences are set at the campaign level, but can also be customized at the Ad group level. Language: Note that this field determines on which publisher pages your ads will display. Selecting the language means the viewers of your ad understand that language. Your ad text must match the language selected. Wireless connection: Default is All Mobile users (Default) or Wi-Fi Only. The recommendation: If your app is greater than 400 MB, select Wi-Fi only. If your app is less than 400 MB, leave at All Mobile users. Age: All (default), or select age groups. Note that Strict age targeting is deterministic (when not selected, Age targeting is probabilistic). Gender: All (Default), Male or Female. Note, also, that Strict gender targeting is deterministic (when not selected, Gender targeting is probabilistic). Interests: Select from categories of users defined by Yahoo (Optional). Note that this is not recommended for use with app install campaigns. Custom audience: Target by Mobile Device IDs or Lookalike Audience (optional). For managed accounts using Custom segments, use the standard set or select Create a custom set for this campaign > enter the segment IDs, one per line, for the custom segment. Go to the Master List of Native & Search Native Targeting Segments to obtain segment IDs. Ad Schedule - no longer applicable for oCPC. 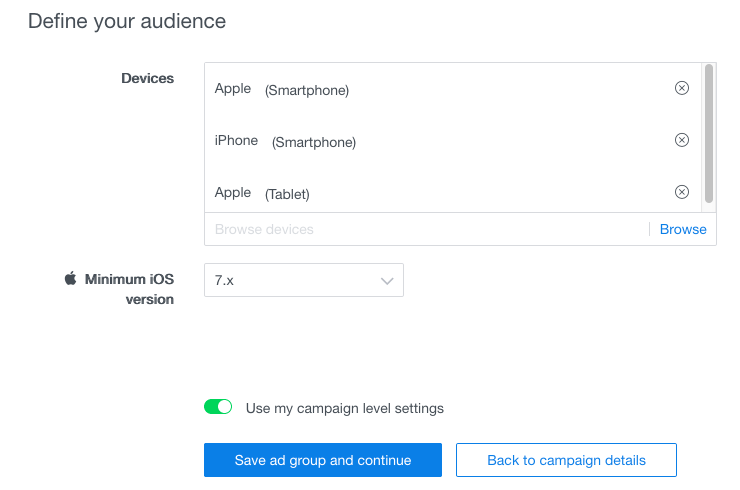 Select the Devices you wish for your download app campaign, including minimum OS version, and whether you wish to use your campaign level settings. Once you’ve completed those selections, click Save ad group and continue. The Tumblr post URL is optional. Third-party tracking is optional. If you select None, Native & Search will take users to the app store, but conversion information won’t be available within Native & Search. Once server-to-server tracking has been enabled before campaign creation, you won’t see the Third party tracking field at the Ad level. It will be invisible because you’ve already established server-to-server tracking with your third-party vendor. Note that there is no need to upload click URLs. Ensure that you’ve completed the all the options for your Download my app campaign. You can check the status of your campaign when you click the Manage ads tab. 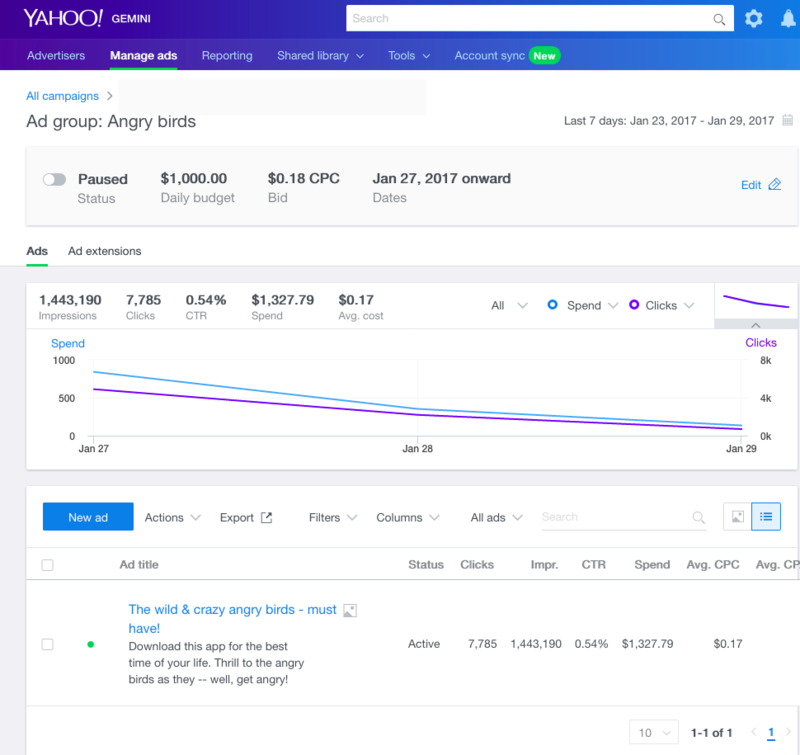 In the Ad groups panel, you can also view the performance of your ads. If you need to edit the details of your ad, click the pencil icon in the upper right corner. Before and after the launch of your app install campaign, consider the following creative best practices and optimization techniques in order to drive results. As a best practice, create one Campaign for each device + operating system pairing. By having multiple campaigns, you can better identify high and low performing ads for different devices and operating systems, and then optimize post-launch. The following optimization tips are designed to: Increase CTR, post click conversion (aka CNV), ensure attribution for Yahoo clicks/impressions and drive down eCPI. Drafting enticing ad copy directly related to your app’s use and functionality is the key to a successful install campaign. Be prepared with several sets of ad copy. You may wish to pair various ad variations with different images to generate numerous unique ads. Regular copy refreshes is a best practice. We have found that a weekly cadence of rotating in new copy is preferable. Optimize the ad title to reflect the app’s use and benefits. Rather than using the title field for the app name (which is conveyed in the “Company Name” field), try something that grabs the attention of users like a question or a call to action. For example: “Save $25 off your first hotel purchase of $100 or more”. Two image assets are required for the end card. The two required asset sizes are: 1200x627 and 627x627. Images should be 2MB maximum in size. You have the flexibility to add higher resolution images for each size, provided they are in the same aspect ratios: 1.9:1 and 1:1. For example, you could upload a 1000x1000 image instead of a 627x627 image, but you cannot go below a 627x627 resolution. We highly recommend that no Ad Copy or Text appear in the Image. There are other elements in the ad execution (title, description, etc) that provide ample opportunity for ad copy to accompany the image. Images may not contain more than 20% text. Font size must be between 30 and 45 points. Utilize numerous images (5-10) for each campaign in order to identify more popular images and optimize toward users’ preferences. Just like ad copy, regular image refreshes are a best practice. Rotate in new images on a recurring basis (weekly, preferably). Test including a brand logo in images. The brand logo will assist in conveying the app’s authority to users. Video Bitrate: 300kbps. Recommended 500kbps. Audio Quality: If the video has audio, then it must have 2 channel stereo and minimum 32kbps. Recommended 64kbps. Device targeting: Users with newer devices like iPhone 7 may be more likely to install the advertised app compared to users with old phones (iPhone 5). OS targeting: Make sure you target ads only to operating systems that are supported by the advertised app. For example, if an app is only supported on OS 7.0+, delivering an ad to devices under OS 7.0 won’t lead to any installs. Refreshing creatives: Refresh creatives at least once every 3-5 days, especially when the performance is declining. Also, it is a good idea to A/B test creatives wherever possible. 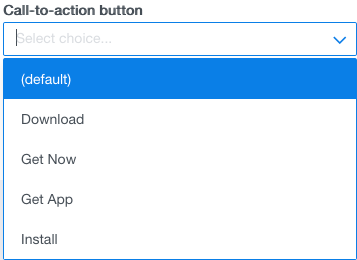 You can also create App Install campaigns in Bulk with the bulksheet. You download a sample bulksheet and follow the steps outlined in that section. If you’re a developer with a background in Software Developer Kit (SDK) integrations, you can enable Native & Search ad network with your tracking vendor to get detailed information about your app’s performance. For example, you can learn about app installs, unique user counts, and adoption over time and across geographical locations. Integrate with one of our third-party partners: Adjust, AppsFlyer, Apsalar, Kochava, Party Track, TapSense, Tune, and WDA. Enable Yahoo Native & Search ad network for server-to-server install tracking and in-app event tracking. You need to do this in order to have Native & Search optimize towards your performance goal. Contact us if you require additional support or want to inquire about integrating with a third party not listed above. You can use the campaign objective, Re-engage my app, to drive users to relaunch your mobile app and optimize to in-app events. You start by selecting the objective for your campaign. 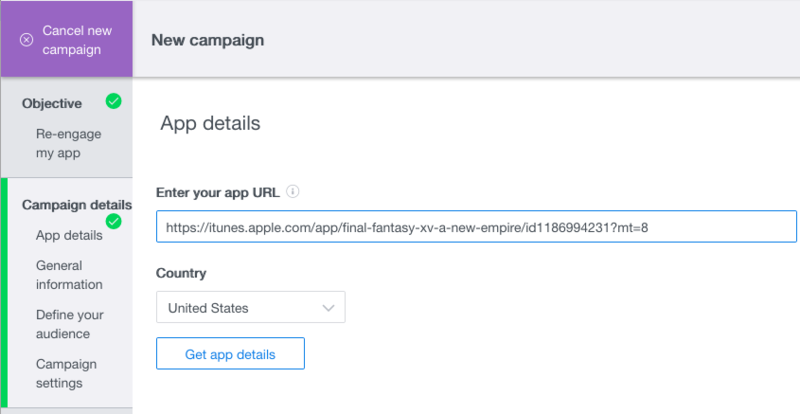 Follow the same steps as outlined above for creating your campaign, entering the iTunes Store or Google Play store URL for your app, defining your audience and filling in the required fields for your campaign settings. Your landing URL will deep-link users directly to the desired section of your app. Your campaign will support only Universal deeplinks or a deferred deeplink which looks like a website URL. For example, use URLs like https://www.myapp.com/buynow/123. Increase user retention and return with in-app, post-installation events. Tap into Yahoo supply via Native display. Increase your mobile app marketing revenue by unlocking a new type of demand and lift in mobile eCPM. Leverage existing App Install campaign installation conversion data. Consider this scenario: You’ve created a new Re-engage my app campaign and would like to optimize to in-app events. Enter your app store URL. Select Dot tag & conversion rule. Select the audience to retarget. Create Native ad creative details. Consider another scenario: You’ve created a new Re-engage my app campaign and would like to create conversion rules in order to report and optimize on your in-app conversions. You can still continue creating and launching the campaign, but your bidding strategy will be to focus on clicks only. 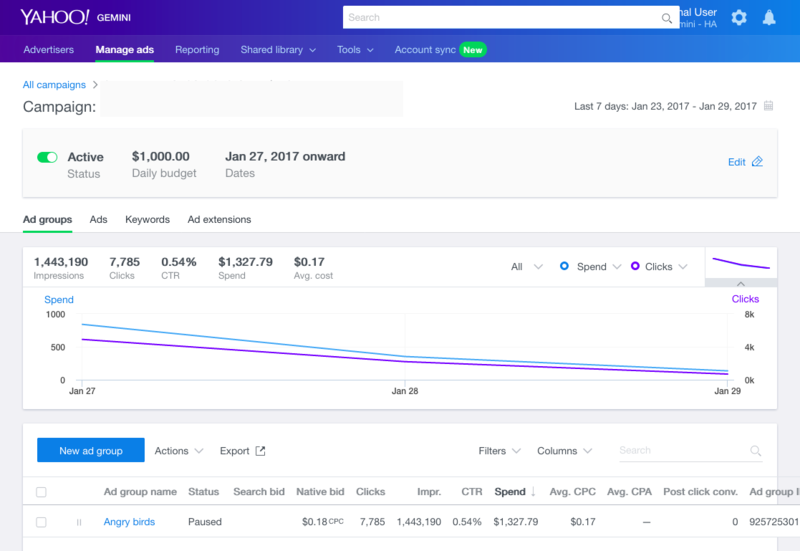 Follow the same steps as defined in Use Case #2 for your campaigns, ad groups and ads, but with the bidding strategy only focused on clicks, with no conversion rule selected. Consider this last scenario: You’ve created a new Re-engage my app campaign, but without conversion rules. You can still continue creating and launching the campaign, but your bidding strategy will be to focus on clicks only. The targeting audience will require an upload of mobile ids. For more information on using Re-Engage App campaigns in Bulk, see Bulk field objects in campaigns. To learn how to set up in-app events, refer to Create an Audience of In-App Events. To create conversion rules for your campaigns and select rules from a list available at the advertiser level, refer to Use Conversion Rules for Your Campaign.